The Mirror Pond Bungalow is a classic 3 bedroom 2 bath historic Craftsman bungalow in a quintessential Bend location. On Bend's popular Westside literally steps from Drake Park, Mirror Pond, and Downtown Bend, you can leave your car and WALK EVERYWHERE! Or, hop on one of the cruiser bikes provided, and explore the historic neighborhoods of Bend like a local. Listed in the US National Register of Historic Places and built in 1923 during Bend’s Mill heyday by Benjamin and Elisa Hamilton, this important home has been lovingly restored and fully updated with all of the modern amenities. Original built-in cabinetry, gorgeous fir wood floors, and fully restored original windows make a beautiful compliment to the fully updated kitchen and bathrooms. Cozy up to the wood burning fireplace in the living room, or enjoy a book in the sunny den. Watch a movie or play games with family in the large garden level entertainment room with Smart HDTV and plenty of cable channels. The comfy, upscale decor will make you feel right at home, and creates the perfect setting for lasting memories to be made! The Mirror Pond Bungalow features a fabulous, fully equipped gourmet kitchen with brand new stainless steel appliances and a chef’s gas range. There is a bright and sunny breakfast nook for you curl up and savor your morning coffee while enjoying the beautiful gardens out back. Sit down dining for 6 in the spacious dining room is the perfect setting for special gatherings of your family and friends. The master bedroom features a new, high quality King bed with European style bedding, high thread count linens and a clean, fluffy down duvet. There are gorgeous linens and down duvets in the Queen bedroom, as well as in the garden level Twin bedroom. The 2 twins can be pushed together to form an additional King upon request. After a day of playing in the hills, come “home” and experience the true down-to-earth Bend lifestyle! Cook out on the gas grill on the old brick patio under a Central Oregon sky filled with stars. Relax and unwind on the large front porch and watch the day go by, Bend-style! If you prefer to get out of town and into nature, there are endless hiking and mountain bike trails just minutes from town. The spectacular Cascade Mountains and many lakes are and easy 20 minute drive providing endless opportunities for outdoor adventures. Phil’s mountain bike trails are an easy 6 miles to the West, as well as many walking and hiking trails along the Deschutes River right out your front door! Oh yes, and did we mention world class skiing? Mount Bachelor Ski Resort is an easy 25 minute drive from Bend. This mountain is a blast, with a wide variety of terrain and trails that will keep you blissfully enthralled. There is a Mount Bachelor Shuttle just up the street that will take you to and from the mountain. All Bluebird Day homes are lovingly cared for with the intention of offering you a world class authentic Bend vacation experience. Locally owned and operated, we provide you with a unique opportunity to experience the magic of Bend like a local. We care about our neighborhoods and community, feel passionate about preserving historic properties, and are delighted to offer you a glimpse of our unique and friendly Bend lifestyle. All of our homes proudly feature European style bedding, a washer dryer for your personal use, free high speed wireless internet, games, books, and much more for you to discover! Great location, very well appointed, comfy and clean. Great stay! The Mirror Pond Bungalow was perfect for our stay. It was cute, cozy and clean and within walking distance of town. There is so much to do and see in and around Bend. We thoroughly enjoyed our stay. We thoroughly enjoyed our stay. The house was perfect for six people. We were very comfortable and enjoyed use of the kitchen. Most of all, the location was awesome! We stayed at the Mirror Pond Bungalow for an annual ski trip and had a lovely stay. The house is walking distance from 10 Barrel, Sunriver Brewing and downtown Bend, and has easy access to the Cascade Lakes Scenic Byway to get to Mount Bachelor. There was plenty of space for our group to have appetizers in the living room, meals in the dining room and to play games at the dining room table. Rebecca was easy to communicate with and responded quickly to questions. The house was in our perfect location- we walked to town to a different coffee shop every morning, and then later walked back to town for dinner. We could easily bike around the historic neighborhoods and to a bike trail using the 4 bikes provided. FYI- you can also bike to many breweries and a great donut shop.We almost lost the opportunity to tube down the Deschutes because the wait was so long to rent tubes. We drove back to the house, grabbed two tubes and the raft from the garage, had them blown up were you rent the tubes, and we were in the river in no time. We exited at Drake Park and walked the block back to the house with our tubes. Bluebird checked in with us via email to see if we had any questions the day after we checked in. We definitely recommend this house! We loved our stay at Mirror Pond Bungalow! The property and grounds were immaculate, and every need we might have had was already considered. The bungalow is quite comfortable, and the location is perfect! It is close enough to all parts of town and the park so we could walk everywhere after a day at the lakes or on the trails. The neighborhood is lovely and quiet, even so close to everything. I would definitely recommend this rental! I cant say enough about the wonderful time we had at the Mirror Pond Bungalow. Our expectations were met in every way. The house is adorable, clean and in the best part of town for a visit. With the river a block away and downtown two blocks away, we walked and rode bikes everywhere. The team from Blue Bird was excellent to work with and thought of everything to make our stay comfortable. We highly recommend this home! This home was well appointed. It had a terrific location... Id like to say a big thank you to the owners for thoughtfully stocking bathrooms and kitchen with all the go withs. Were from South Carolina and were very appreciative of a the hearty welcome we felt. We loved staying here during our week in Bend! The house is only one block from Mirror Pond and five blocks from the restaurants and shops yet the neighborhood is quiet and serene. We would stay here again on our next visit to Bend. The house was comfortable and cozy and had all the essential amenities. A wonderful home! This home is truly the best. Perfect location, beautifully decorated, responsive owners. We used the bikes the entire time we stayed in Bend. We are hoping to come back for a winter visit in order to ski! This home is lovely, comfortable, well-appointed and in a fantastic location. We thoroughly enjoyed a long weekend in late winter. As Oregonians, we love the Bend area and enjoy all its seasons. Everything is a pleasant, easy walk from this home: Drake Park, downtown and NW Bend shops and eateries, McMenamins, Deschutes brewpub, on and on. The folks at Bluebird Day are true professionals who excel at communication and customer service. Wed recommend this home in a heartbeat! We had a great time and thoroughly enjoyed your home. The house was very well stocked with everything we needed. Very quiet neighborhood and very convenient to downtown Bend. We hope to stay here again. Thank you! The Mirror Pond home worked out very well for us. 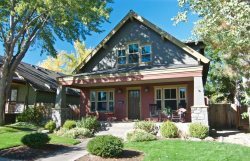 The location is perfect with easy walking distance to downtown and all points within Bend. Bluebird properties have been very consistent as this is our 2nd time in Bend and when returning we will be reviewing their properties again to see what is available before looking anywhere else. We felt right at home as soon as we walked in and our week was filled with Hiking, dining and enjoying the winter months which is quite different from our last visit. We loved this house! The location is outstanding, easily within walking distance to all the restaurants and activity of downtown. Also within asking distance of Galveston St. Just a block away is drake park where we took our kiddos every day. Mt bachelor is about a 25 min drive, traffic depending. The house itself is adorable and decorated perfectly. The upstairs has two bedrooms and a bathroom. Downstairs is entire separate living area, where a second couple could easily be or older kids. It was awesome for us. This darling historic district bungalow has plenty of room for six and it well maintained and spotless! The comfortable beds are brand new and made with luxurious cotton linens. I love the updated kitchen and sunny Breakfast Nook. Its location is perfect for a stroll around town, a little shopping, a meal out, or a jog around Mirror Pond not to mention a short drive for some skiing or hiking at Bachelor. I love the Craftsman feel to this home along with the updated decor. It is a perfect match! We were so comfy and cozy next to the fireplace we really didnt want to leave. I cant wait to stay here again! My family stayed here over the Thanksgiving holiday. This home is charming and has beautiful woodwork. The kitchen is very functional and we had no issues preparing a Thanksgiving dinner and serving on the lovely dining table. Everyone had a private bedroom and there was enough space to spread out. The location is excellent for getting out and enjoying downtown Bend on foot. This house is a charmer. This was a wonderful place to stay in Bend. The home was very comfortable and the location was perfect. The tulips were in full-bloom and couldnt have been more picturesque. We all loved our stay and wished that we could stay longer. Even though we walked everywhere there was more to explore. Were hoping to be back sometime soon. For two couples looking to adventure around the Bend area, the Mirror Pond Bungalow could not have been a better choice in lodging. From accommodations to central proximity, the Mirror Pond was everything you need in one nice historical little package. The space is easily shareable, larger than photographs elude too, and comfortable enough for nights in or long sleepy mornings. I would recommend the Mirror Pond Bungalow to anyone...as long as they werent planning a visit when I was ;).